December 20 we arrived in Munich, but the journey was not as smooth as one may expect, but more on that in a future post. The plane that took us to Munich was one of the smallest I have ever been on, with only four seats in every row. At the airport we would wait for Sarah’s family, who would arrive an hour or so after us. We wandered a bit across the airport, and were surprised to see our first German Christmas market. We met up with Sarah’s family. For me it was the second time to meet her mum and dad, and the first time to meet her brother – would I prove worthy? We got onto the S-bahn to our hotel, the Holiday Inn Munich. The S-bahn is a city centre and suburban metro system, which is to be found in most larger German cities. In the city centre they are often subterranean, but they surface when you ride them farther out of the centre. They are affordable and easy to use, and most importantly, they get you where you want to be quickly. We left our suitcases at the hotel, and headed out for one of the most famous Christmas markets in Germany (and perhaps the world): the Christkindlmarkt, on and around the more than 800 year old Marienplatz. We sauntered through the market for at least two hours. Everything was breathing Christmas: warm, yellow lights, children in awe of big and small Santas while their parents drink some hot glühwein (mulled wine), way too expensive souvenirs, and here and there a Christmas carol sung by a choir. The absolute climax, at least according to me, is the huge, lit-up tree (see picture below). It is massive, and decorated with hundreds and hundreds of lights. I could, and almost did, watch it for hours. I love Christmas trees with soft, evenly distributed, yellowish lights. They remind me of nice Christmas get-togethers, which I cannot really remember actually attending (yet). I don’t think we did much more that day. The next day we took the train to Füssen, a town only 5 kilometres from the border with Austria. From here we took a bus to Hohenschwangau, from which it was only a 30-minute uphill hike to Neuschwanstein Castle – our destination for this day. Neuschwanstein Castle is perhaps most known for that it was the main inspiration behind Walt Disney’s Sleeping Beauty Castle. The story behind Neuschwanstein’s creation is very peculiar yet extremely fascinating. I don’t remember everything our guide told us, but here are some bits and pieces from Wikipedia I d0 remember. King Ludwig II commissioned the construction of the castle in 1869 (hence, the castle is not even that old). It was ‘finished’ in 1892. King Ludwig II only lived in it for a little more than 100 days, after which he was deposed and removed from the castle. To the present day, his death remains a mystery. Almost immediately after his death the castle was opened to the public. The construction has never been finished, although the exterior does seem more or less finished. The castle was dedicated to Richard Wagner, the famous German composer. The castle pays a particular homage to the German legends of Lohengrin, the Swan Knight. Wagner adapted the medieval tale into one of his popular operas. The swan is prominent as a symbol: Ludwig II was also known as the ‘Swan King’, and it features in the name of the castle itself (Neuschwanstein). Another, rather odd feature of the castle is a grotto; an articial cave with waterfalls, in this case representing a cave from Wagner’s famous opera ‘Tannhäuser’. I could not believe my eyes. In the middle of the castle, painfully contrasting with the gilded decorations of the adjacent rooms – a cave! I am not knowledgeable of art at all. I always feel like a simpleton when in art museums or when I am admiring old town centres – but now I was entirely lost. Most castles that I visited so far are not really glorious themselves anymore, as they are reflecting some past, sometimes almost perished, glory. Once places of power and beacons of seemingly everlasting invincibility, often the only things left to attest to this are the remaining ruins. Neuschwanstein is somewhat an opposite. It was never meant to be a house of ruling power or to withstand ferocious attacks. It was more an artwork, a rich man’s pet project. But it was not even this, given that the rich man hardly used it – it was opened to the public almost immediately (even before its ‘completion’). Contrary to other castles, Neuschwanstein is not so much something that has been, but more something that could have been. Realising this, walking through the castle’s beautifully shaped and richly decorated hallways, I did not really know what to feel. Afterwards we hiked up to the Marienbrücke (“Mary’s Bridge”), a bridge spanning the Pöllat Gorge. Apparently, we were not really allowed to enter the path up to the bridge (left side of picture below). However, we saw multiple people jumping over the fence that barred the path. Walking on an at some points a bit icy, slippery path, we reached the bridge, where my fear of heights was to be tested for the first, but certainly not the last, time this trip. Well, I made it onto the bridge, and I think I even managed to produce something that could opportunistically be classified as a laugh (picture below, right side). 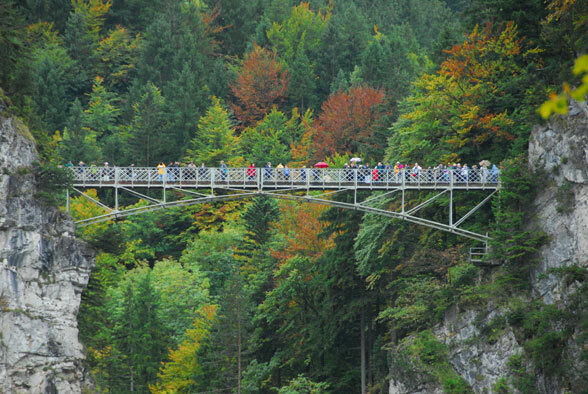 If you visit the Neuschwanstein Castle, don’t forget to hike up to the bridge. The view is amazing. It is perhaps only from here that you can truly appreciate the elegance of the castle as well as its remarkable position on a rugged hill, overlooking Hohenschwangau, Schwangau, and even distant Füssen, while being sheltered by the first Alpes. Having travelled back to Munich, we refreshed ourselves at the hotel. We went out for dinner. The choice fell on Kam Yi, on the Rosenheimer Straße. Chinese food – yummie! The next day we would cross the border with Austria. We took the train to Salzburg, where we would stay for two nights in the Holiday Inn Salzburg. The first day would present the biggest challenge of the trip to me. I knew we would ascend the Untersberg. 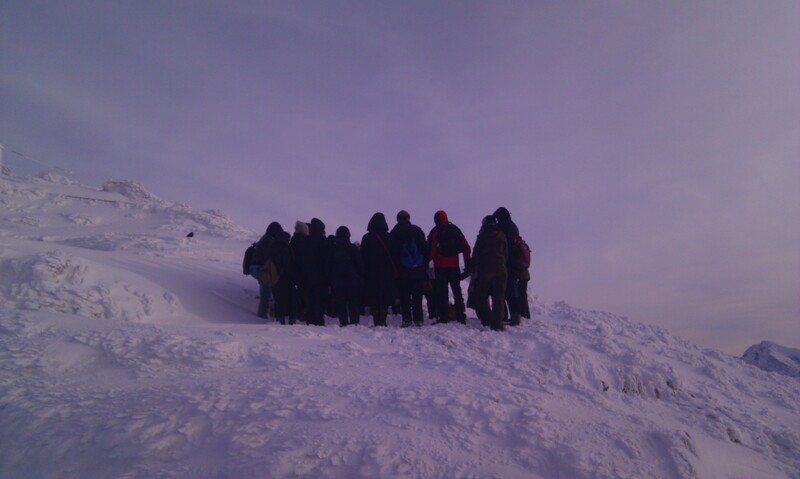 Completely unaware of any fact relating to the mountain, I expected a nice, cosy train ride – or something like that. We rode the bus towards the town of Gartenau. Alighting from the bus, I saw them. Big, strong, and made of metal. Cables, disappearing into the clouds. No way I was going to entrust those cables with my life. Pictures taken from the top of the Untersberg. In the middle: Sarah and me. As the pictures above may show, it was totally worth it. The views are amazing. The world up there is so different from the one below it. Cold winds lash in your face. Everything is covered by snow and ice. But especially the views – they are gorgeous. It is as if you are on a plane, looking down – only now you have all the time to focus. We hiked up to yet higher point, which proved to be quite the work out. Along the way, we found a circle of people, who were (what seemed to be) praying. Perhaps it had something to do with the end of the world, which according to some should have happened the day before. From the Untersberg, we took the bus (no, not from the top – we took the cable car down first). We got off near Hellbrunn Palace, where a massive Christmas market was located. Here, I had my first glühwein of the season. Not a fan. We walked around the market for quite a while, also admiring the massive sturgeons in the pond. We got back to the centre of Salzburg. We ate Italian at Sabroso, and in the evening we had some drinks at a sports bar on the Linzer Gasse. We spent the next day exploring Salzburg. Having been at a castle dedicated to Richard Wagner, today we would saunter through the birthplace of yet another famous composer: Wolfgang Amadeus Mozart. We did so quite literally since we visited the house in which he was born, at the Getreidegasse. Additionally, we rode the Festungsbahn up the Festung Hohensalzburg, which we subsequently explored. We visited the Christkindlmarket on the Domplatz. We stumbled upon the Petersfriedhof, a beautiful, colourful cemetery, with gorgeous chapels, churches, and hidden paintings. From here, we visited the catacombs, which are carved into the rock of the Festungsberg – some of it was created longer than 1.000 years ago. Perhaps finally (I must be forgetting other things we did…) we ventured to the Stiegl brewery, where we took the tour. Our entrance tickets entitled us to three ‘small’ sample beers. Samples – well, they are still bigger than regular beers as they are served in the Netherlands. We gained free entrance to the brewery with the Salzburg Card, but also to the Unterberg cable car, the catacombs, Mozart’s birthplace, the Fortress funicular, and more. We bought it when we arrived in Salzburg. Buying this card is absolutely recommendable; it gives you free entrance to the most interesting places in and around Salzburg, and it also gives you access to public transport. The other day we travelled back to Munich, and checked in at the hotel we stayed before. We sauntered through the Christkindlmarkt again, and went into the Dom (the Frauenkirche). When I enter a church or cathedral that has a similar size as this Dom, I am, almost without exception, in awe of what I see. Not this time. The Dom is hardly decorated – we were outside again in a few minutes. No, St Paul’s is still my favourite. We relaxed a bit during most of the afternoon, and did some Christmas shopping (and wrapping). In the evening we went to the Hofbräuhaus (HB). The HB is a brewery and a restaurant. A massive restaurant – it can seat thousands. If you arrive (and if it is busy, as it was when we got there), you have to patrol the area in a hunt for seats. We were lucky, and found some seats quite quickly. We all ordered traditionally German food: from Bavarian veal ragout, to slices of braised knuckle of pork. I had Munich-style sauerbraten – delicious, once again! The best part of dining in a (beer) brewery is, of course, the beer. My first full litre of Bavarian beer! Gosh, do I have respect for the waitresses, who sometimes lug around 6 or even 8 of those giants! YES, 1 litre of beer! I was pleasantly surprised by the hospitaly of the HB. We had dinner there on Christmas Eve – a night during which a lot of money can be earned. The HB nevertheless opened its doors to the homeless people – the biggest room, which can seat a thousand people, was used for this purpose. For one evening, they could forget their sorrows, and… eat. After having dinner at the HB we went back to our hotel. We got upstairs and got our Christmas presents. We sat down in the nicely decorated hotel lobby, where we exchanged gifts. The evening was nice and cosy, just as a Christmas evening should be. During the last full day, Christmas Day, in Munich we did a lot of walking. We sauntered through much of the city centre, stopping here and there at interesting places. We walked through the Englischer Garten, and had lunch underneath the Chinesischer Turm. We walked further, and were surprised to see… surfers. Surfers?! Yes, through the Englischer Garten flows a little (artificial) stream so rapidly that it can have a so-called standing wave, on which daring individuals can surf. In the evening we had yet another typically Bavarian dinner – this time at the Augustiner am Dom. This place is a very cosy restaurant, serving Bavarian dishes at decent prices given its central location. This time I had pork knuckle, and once gain, yummie! Well, I guess that was about it. We walked to our hotel slowly, having some ice cream to go as a dessert. We packed our bags, because the next morning we would be leaving for the Netherlands. We were about to celebrate the second part of Christmas with my family, in the rural town of Aalten, almost on the border between Germany and the Netherlands. Perhaps more on that in a next post. This entry was posted in Travels and Trips and tagged Christmas, Christmas markets, Hofbräuhaus, Munich, Neuschwanstein, Salzburg, travel, travelling, trip, Untersberg.